Go forth and conquer the trails with SENSE RIDE. With enough cushioning to push the mileage, an 8mm heel drop, and proven fit, it has you ready to go all day. 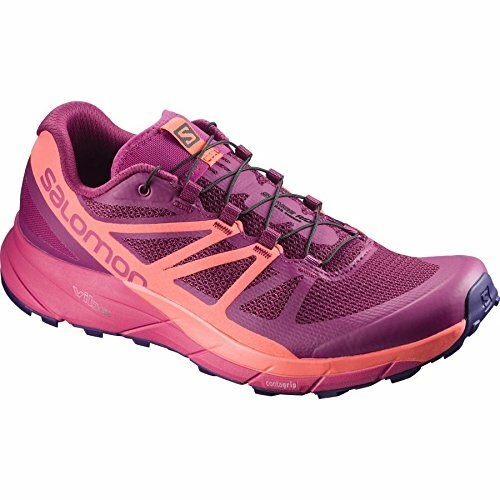 Comfort – Generously cushioned, Sense Ride makes the longest runs and the roughest surfaces a lot more comfortable. Ride – Built with a natural rocker profile, the sole and midsole of this shoe help you keep putting one foot in front of the other.. Grip – Contagrip sole offers great traction on soft or hard, wet or dry surfaces..
Lace pocket – Provides easy storage for the Quick Fit lacing system. Sensifit cradles the foot from the midsole to the lacing system, providing a secure, snug, and virtually customized fit all around the foot.. Quicklaceƒ,› – Minimalistic and strong lace for one-pull tightening. Easy-on, easy-off..
Friction-free lace eyelet – For quick and easy one pull lacing.. Molded EVA provides excellent next-to-foot cushioning and anatomical support. OrthoLiteAr sockliner combines a specific OrtholiteAr foam and an EVA heel cup. OrtholiteAr foam creates a cooler, drier, healthier, better-cushioned environment under the foot. It will not break down or lose effectiveness over time..
3D stretch air mesh – 3D open mesh provides maximum breathability.. Compressed EVA. Profeel Film engages during the transition phase to support the foot and improve the overall rolling of the shoes during toe-off. It provides a mechanism linking the rear part of the shoes to the forefoot, and provides consistency and stability through the middle of the shoe..
EndoFitƒ,› – an internal fit sleeve designed to hug the foot in exactly the right places and improve feedback and footwrapping. EnergyCell+ is a high-rebound midsole compound that provides exceptional energy return while also delivering substantial cushioning and durability.. Vibe Technology is the combination of EnergyCell+, Opal, and unique assembly that work together as a system to attenuate vibrations, reducing a potentially harmful load to the body while delivering a responsive ride..